Meet the Sycamores – a madcap clan who sets the bar for eccentricity. When Alice brings her high society fiancé home to meet the parents, fireworks (figuratively and literally) nearly bring the house down. Despite their zany antics and unconventional ways, this tight-knit family offers hope that love and laughter lead to happiness, even in the hardest of times. 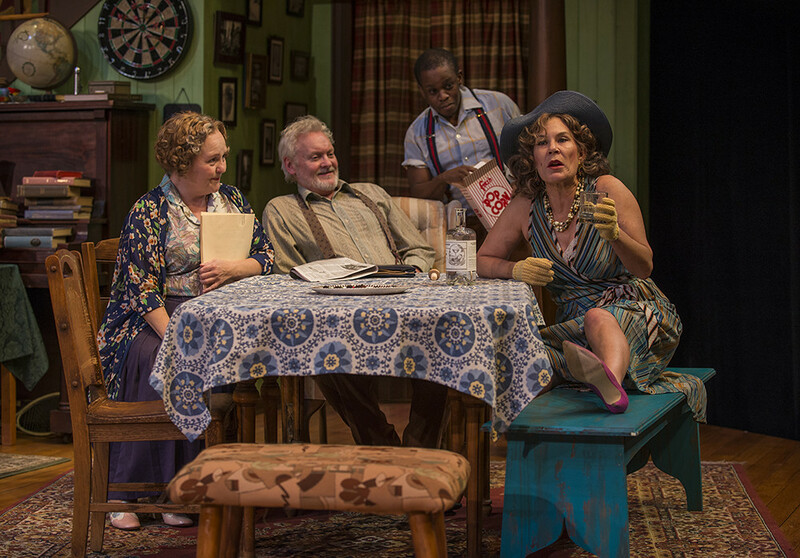 One of the most popular and successful comedies in American theatre, this Pulitzer Prize-winning, Depression-era classic has a timeless appeal. 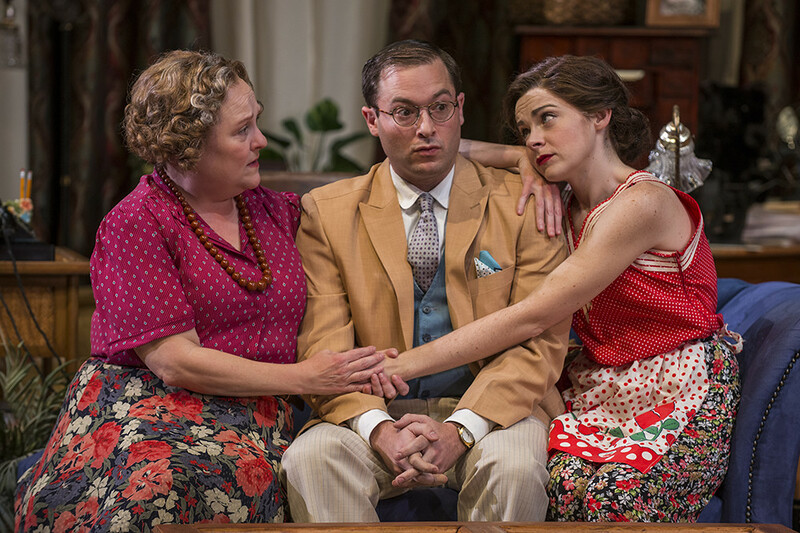 You Can’t Take It With You has endured through the decades, and Northlight Theatre’s hilarious revival in Skokie shows why. Moss Hart and George S. Kaufman’s Pulitzer Prize-winning 1936 comedy is chock-full of lovably eccentric characters who would easily fit into any modern-day TV sitcom. Also still relevant are the show’s heartwarming messages about family, creativity and the precious brevity of life. Director Devon De Mayo’s sometimes unconventional casting makes Northlight’s production a delight throughout. Anyone familiar with the play through amateur productions will marvel at how much better professionals can be at finessing and consistently delivering the comic material to prod audiences into gales of laughter. 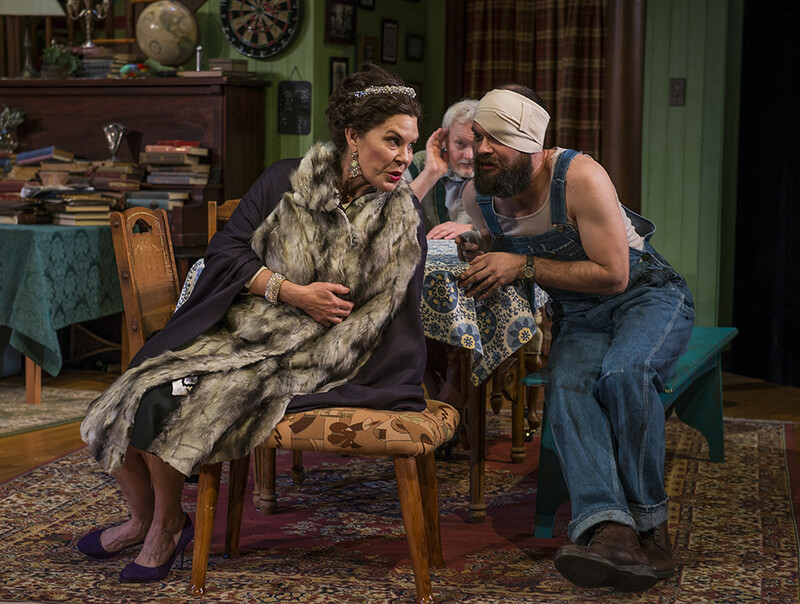 Even if it’s nostalgia that helps keep the play alive, this Northlight Theatre revival is a surprisingly fresh production, featuring a huge cast of characters whose various eccentricities are orchestrated with elegance by Devon de Mayo. “You can’t take it with you,” the patriarch of the Sycamores reminds his counterpart Anthony P. Kirby, a wealthy Wall Street stiff, and while sure, it’s cliched, it’s not overstated. And from dance-obsessed Essie (Joanne Dubach) to painter-turned-playwright Penelope Sycamore (Penny Slusher) to Boris Kolenkhov (Sean Fortunato), the Russian ballet master, there isn’t an actor here who doesn’t delight. 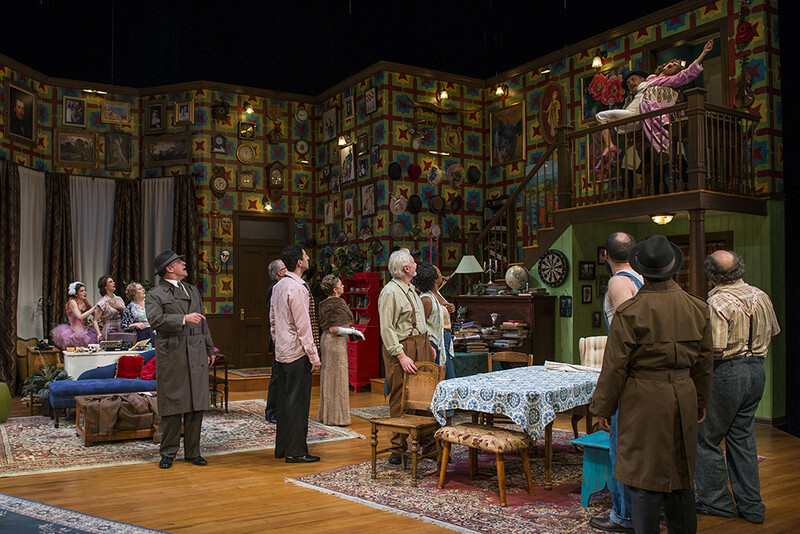 A funny thing happens on the way to the second act of You Can’t Take It With You, now at Northlight Theatre through Dec. 13, 2015. Maybe this comedy which took the 1937 Pulitzer Prize for Drama, and won the Academy Award for Best Picture in 1938, really should be looked at again. 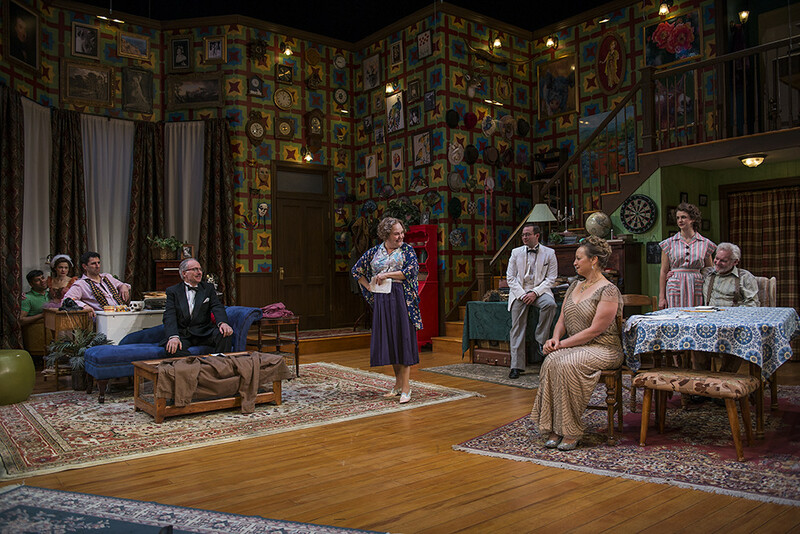 Fortunately, Northlight Theatre brings the play back to life with fine direction by Devon de Mayo and outstanding actors. 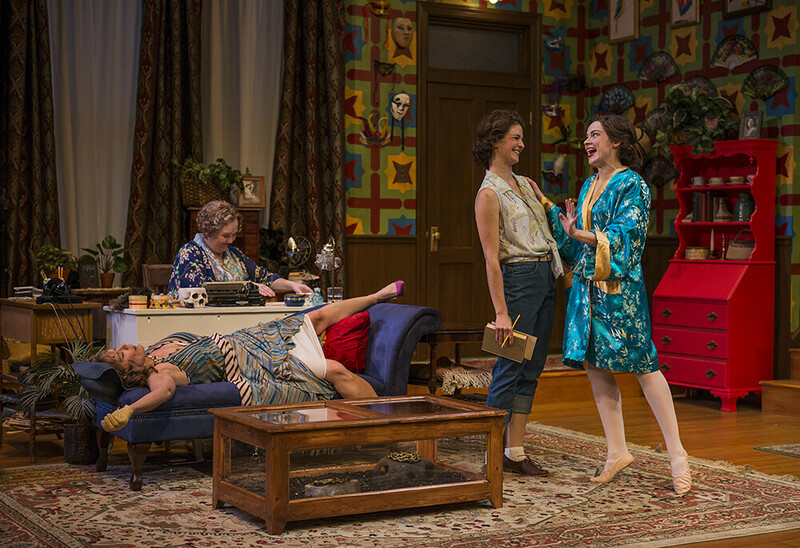 Continuing its 41st season, Northlight Theatre presents the Pulitzer Prize-winning comedy You Can’t Take It With You, directed by Devon de Mayo. Quirky and touching, this story of the wacky Sycamore family’s attempts to connect with the straight-laced Kirbys is both entertaining and meaningful. 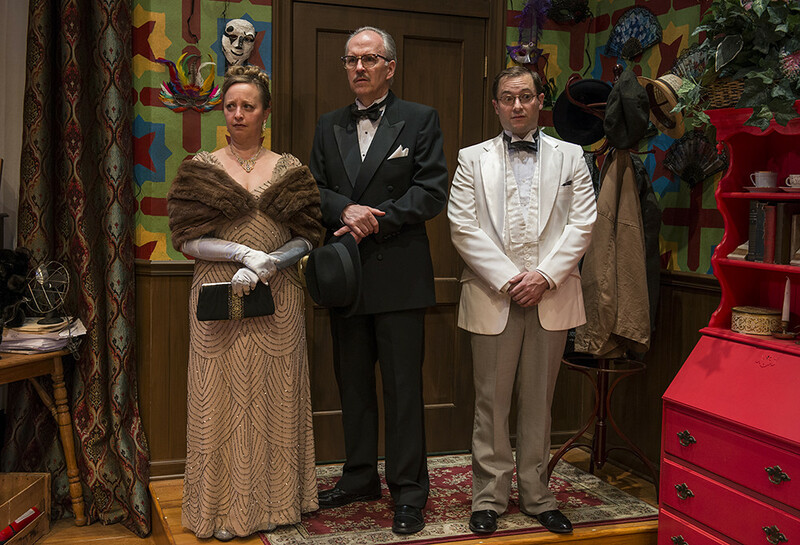 You Can’t Take It With You is absolutely an ensemble show, and Northlight has chosen an excellent ensemble for its purposes. Highlights among the actors include Joanne Dubach, who plays absentminded aspiring dancer Essie with a blend of sincerity, sweetness, and awkward charm that makes her a delight to watch. 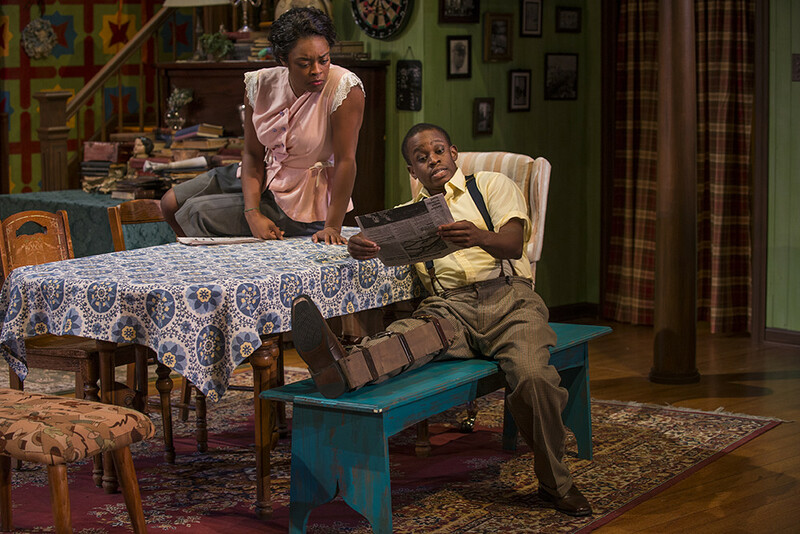 Ericka Ratcliff and Samuel Robertson, who play Rheba and Donald, respectively, bring a vibrant and engaging dynamic to their characters’ relationship and to the stage in general. 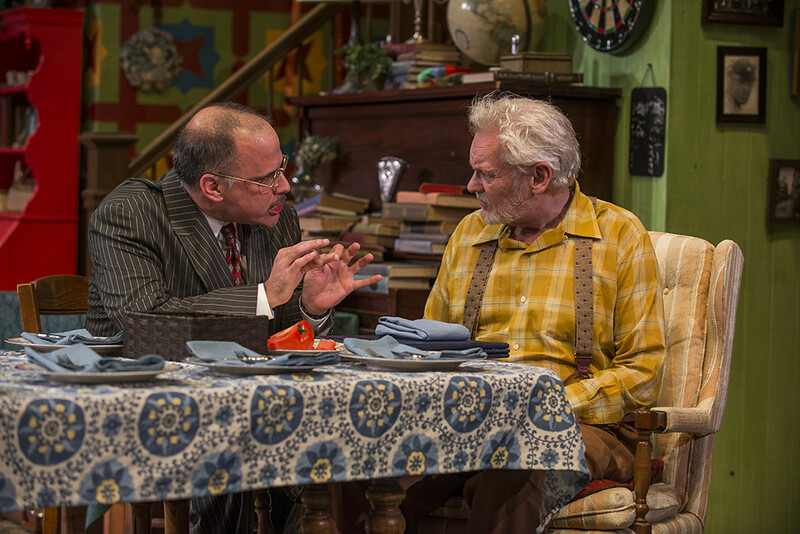 Finally, John Judd must be complimented for his masterful portrayal of family patriarch Martin Vanderhof, whose clever antics to avoid the IRS are at the comedic heart of the play and whose soft-spoken discussion about the purpose of life with Mr. Kirby at the end of the show holds the play’s philosophical center. When Moss Hart and George S. Kaufman penned You Can’t Take It With You, they came up with a plot that paved the way for everything from The Addams Family to My Big Fat Greek Wedding. Take a family of eccentrics and insert a “normal” group in their midst. And make sure that if the eccentrics fail to pass muster with the normals, dire consequences will ensue. For the Pulitzer Prize-winning, 1936 drama You Can’t Take it With You, the loveable crazy people are all members of the Sycamore family. 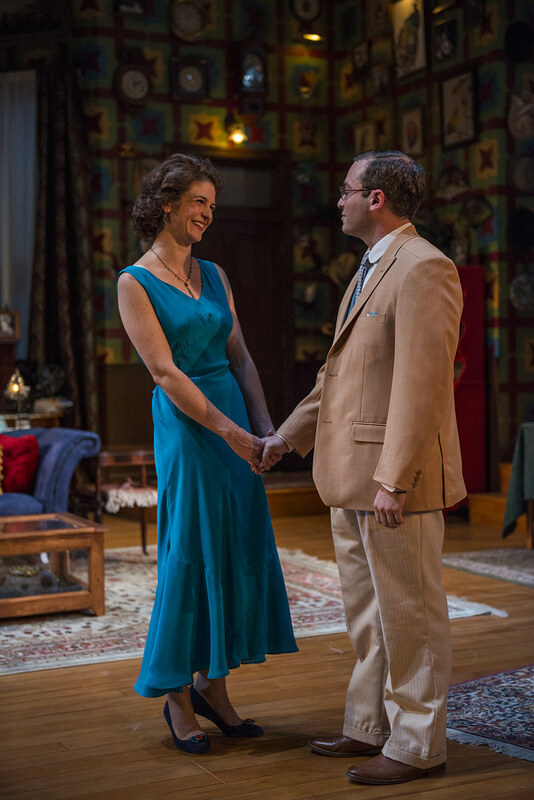 When daughter Alice (Lucy Carapetyan) brings home her buttoned-up boyfriend (Bernie Balbot) and his snooty high society parents (Patrick Clear, Jennifer Avery) for dinner, the evening explodes out of control. Alice wants to impress her future in-laws with her suitability, but Alice’s family isn’t exactly a bastion of Wasp propriety. 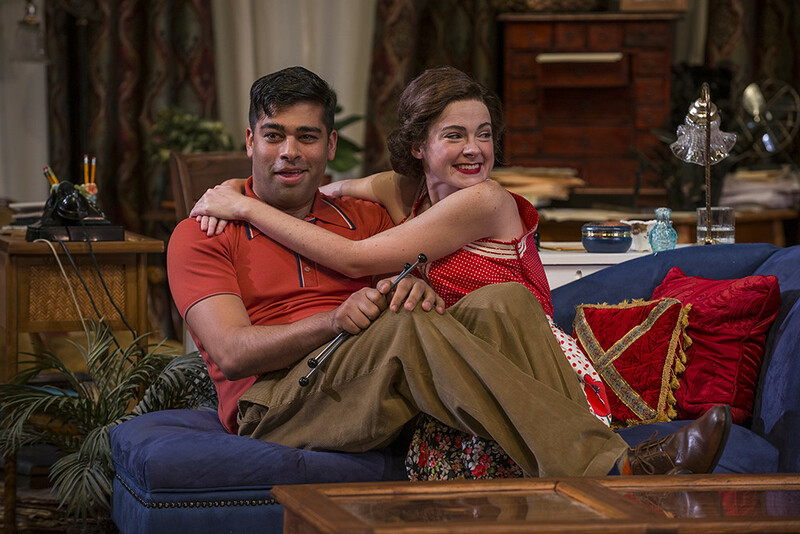 Opening this week at Skokie’s Northlight Theatre, You Can’t Take it With You is a rom-com that celebrates not just the young lovebirds but also the zany, individualistic Sycamore clan. 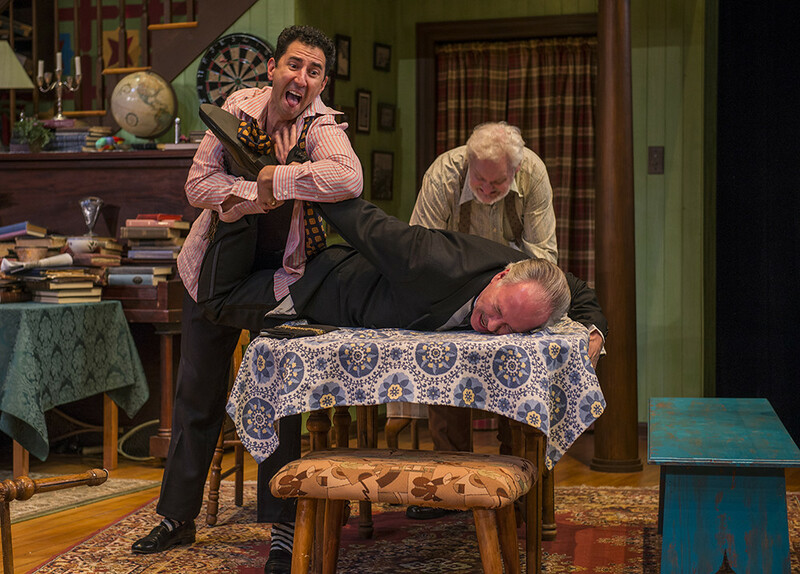 You Can’t Take It With You: Eccentric doesn’t begin to describe the extended family in George S. Kaufman and Moss Hart’s 1937 Pulitzer Prize-winning classic, and with an all-star cast that includes Brad Armacost, John Judd, Hollis Resnik and Sean Fortunato, their antics should be a hoot. If you’ve never seen this comedy, expect a snake-keeping patriarch who hasn’t ever paid his income taxes, a tinkerer who makes fireworks in the basement, a candymaker who dreams of being a ballerina and, the only “normal” one, a young woman whose romance is in jeopardy. That’s not to mention the tax investigator and cops who suspect a terrorist plot. 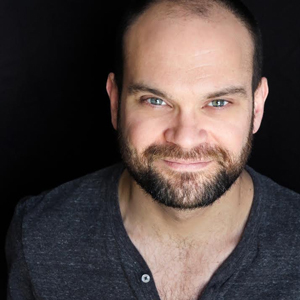 Brad returns to Northlight (Benefactors, A Life) and is an Artistic Associate with Irish Theatre of Chicago (2014 Jeff Award – Ensemble, Seafarer, as well as nominations for The Weirand Moon for the Misbegotten). 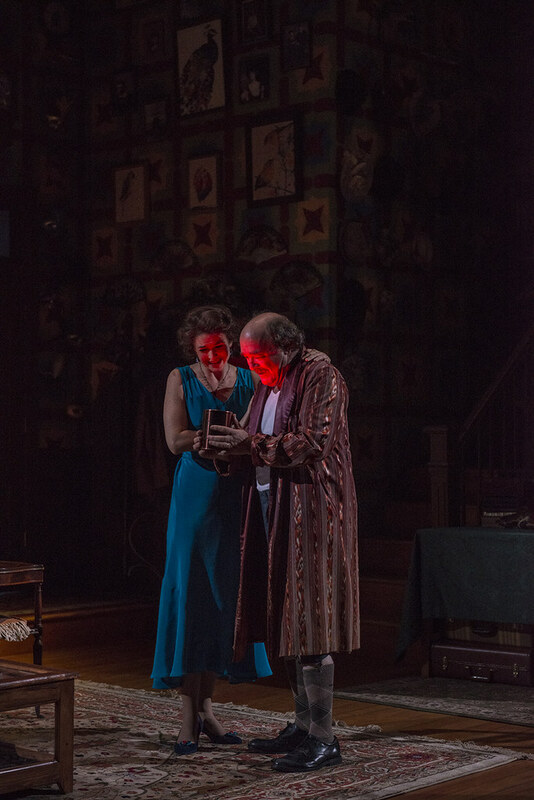 Elsewhere in Chicago: Steppenwolf (Jeff Award – Faith Healer), Goodman, Next (Jeff Award – Are You Now…) and Chicago Shakespeare (Jeff Award – Madness of King George). He is also part of Provision’s ensemble, receiving Jeff nominations for his work in A Christmas Carol, CS Lewis, Onstage and Shadowlands. 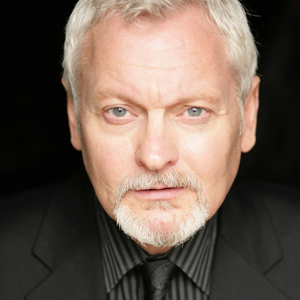 His television credits include Empire, Chicago Fire, Mind Games, Missing Persons, The Untouchables and Early Edition. Film credits: Warren, The Company, Barbershop 2,Repetition, Eight Men Out and Backwoods. He guest narrates with the Chicago Symphony Orchestra. Jenny is thrilled to be making her Northlight debut. Jenny has worked at a number of theaters in Chicago, including Steppenwolf (Annie Bosch is Missing), Writers (Puppetmaster of Wodz,Duchess of Malfi), Victory Gardens (Four Places, Class Dismissed), Next (Compulsion, Welcome Home Jenny Sutter, Maple and Vine, Long Christmas Ride Home), Chicago Dramatists (Feast), American Theater Company (American Dead, Living Out), About Face (Cloud 9, Undone), Collaboraction (Life and Times of Tulsa Lovechild, Apocalyptic Butterflies) and Strawdog (Cherry Orchard, Three Sisters, Aristocrats). She will be seen this winter in Richard III at Gift. Chicago credits include: She Loves Me (Writers); A Midsummer Night’s Dream in the Parks, Short Shakespeare! Macbeth (Chicago Shakespeare); We Are Proud to Present a Presentation… (Victory Gardens); Rich and Famous (Jackalope); The Original Grease, Yeast Nation, It’s a Wonderful Life: A Radio Play (American Theater Company) and A Christmas Carol (Drury Lane). 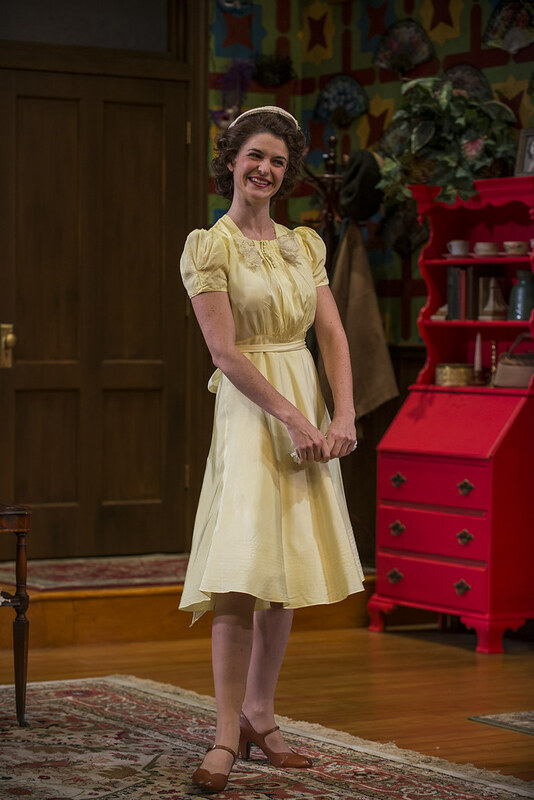 Regional credits include: American Conservatory, Asolo Repertory, Milwaukee Repertory, Utah Shakespeare, Pittsburgh Irish and Classical Theatre and Hangar Theatre. TV/Film: Chicago Fire, Warrior. Bernie is a graduate of Carnegie Mellon University School of Drama and NTI’s Moscow Art Theatre Program. 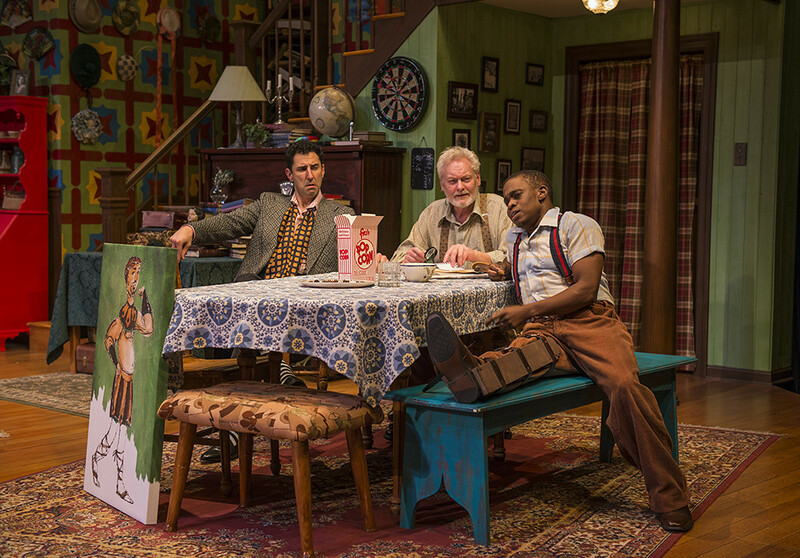 Up next:Of Mice and Men at Milwaukee Repertory/Arizona Theatre Company. Lucy is happy to make her Northlight debut and to work again with Ms. de Mayo. Credits include: Animal Farm, The Crucible (Steppenwolf); The Life and Sort of Death of Eric Argyle, The Hollowlands, Breathing Corpses (Steep); Woman in White, Wuthering Heights (Lifeline); On The Shore of the Wide World, Stage Door (Griffin); Roadkill Confidential (Dog & Pony); The Oxford Roofclimber’s Rebellion (Caffeine); The Magnificents, Rose and the Rime, All the Fame of Lofty Deeds(House); American Storm (Theatre Seven); Twelfth Night (Oak Park); Ring Cycle (Building Stage); Look Back in Anger (Redtwist); A Midsummer Nights Dream, As You Like It (Two Pence). Lucy is a company member with Steep and Two Pence, and on staff at Actors Gymnasium. 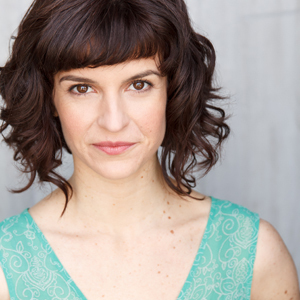 She is a Northwestern graduate and is represented by Paonessa Talent. Credits include: The Diary of Anne Frank, Hedda Gabler, The Real Thing, Travels With My Aunt, Rosencrantz and Guildenstern Are Dead (Writers); Rene Gallimard in M. Butterfly (Court); Measure for Measure (Goodman); Detective Cioffi in Curtains (Drury Lane); over 20 productions with Chicago Shakespeare and work at Timeline, Marriott, Theatre at the Center, Remy Bumppo, About Face, Intiman (WA), Old Globe (CA), The Duke on 42nd (NY) and twelve seasons with Peninsula Players (WI), where he played George in Sunday in the Park with George. TV/Film: Chicago PD and The Merry Gentleman directed by Michael Keaton. 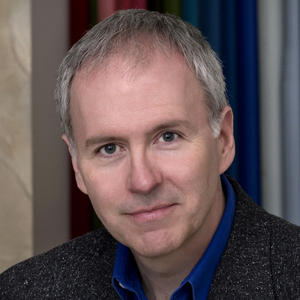 Sean has received four Joseph Jefferson nominations and an After Dark Award. Next: 2666 (Goodman) and Death of a Streetcar Named Virginia Woolf (Writers). Kroydell is happy to be working with Northlight for the first time. He has worked all over Chicago’s stages including TimeLine’s Concerning Strange Devices From the Distant West directed by Lisa Portes, Silk Road’s The Hundred Flowers Project directed by Joanie Schultz, Adventure Stage Chicago, Victory Gardens, understudied for Lookingglass’s world premiere of Keith Huff’s Big Lake Big City directed by David Schwimmer and most recently closed the Chicago premiere of In Love and Warcraft with Halcyon. He has also co-starred in an episode of Chicago Fire. 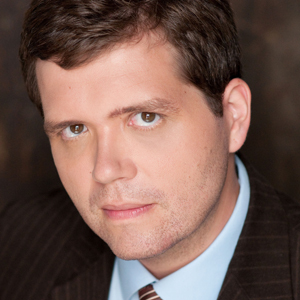 He holds a B.F.A in Acting from The Theatre School at DePaul University. Tom is pleased to be working with Northlight for the first time. 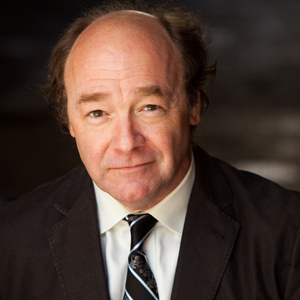 He has been a member of Strawdog Theatre Company for a loooong time, appearing in over two dozen productions including Fail/Safe, Conquest of the South Pole, Master and Margarita, Uncle Vanya, Cherry Orchard, Aristocrats, Detective Story and Julius Caesar. Other shows in Chicago include Macbeth (Artistic Home), Seminar (Haven), Killer Angels (Lifeline), Dirty (Gift), North Plan (Theatre Wit and Steppenwolf First Look), Pillowman (RedTwist) and Thieves Like Us (House). Television credits: Underemployed,Chicago PD, Betrayal and Crisis. John returns to Northlight where he appeared in The Cripple of Inishmaan andThe Lieutenant of Innishmore. Chicago credits include: Goodman, Steppenwolf, Chicago Shakespeare, Writers, Court, Lookingglass, Shattered Globe, A Red Orchid, About Face, Next, Profiles, Victory Gardens, Fox Theatricals, The Journeymen and Irish Repertory of Chicago. New York: BAM, Barrow Street and 59E59. 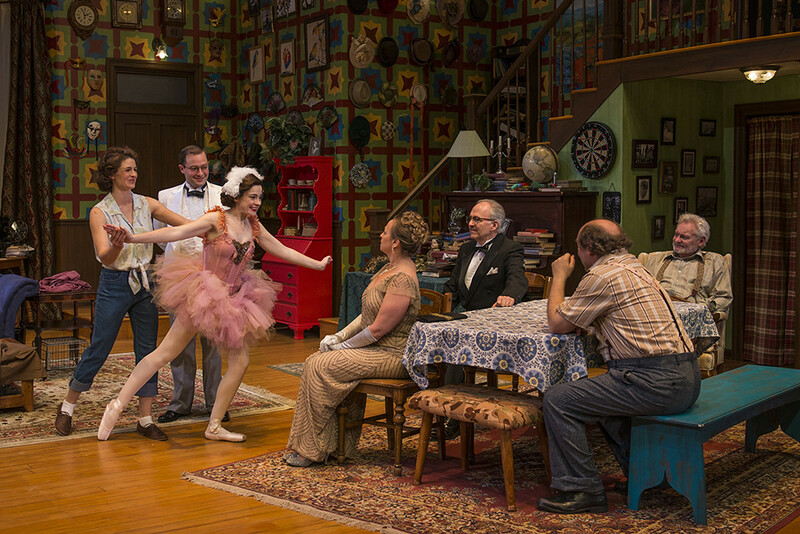 Regional and international: Actors Theatre Of Louisville, Philadelphia Theatre Company, City Theatre (Pittsburgh), Old Globe (San Diego), McCarter (Princeton), Huntington (Boston), Williamstown Theatre Festival, Westport Country Playhouse, BeaverCreek Theatre Festival and Town Hall Theatre (Galway, Ireland). Film credits include: Public Enemies, Batman Begins, Mr. 3000, Road to Perdition, Ride with the Devil, Losing Isaiah and Hoffa. TV credits include: Chicago PD, Boss, Chicago Code, Prison Break,ER and Early Edition. Andy is thrilled to be making his debut at Northlight. 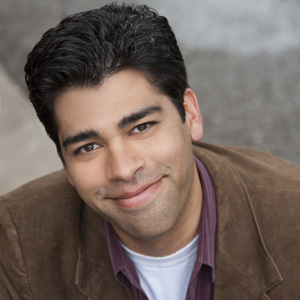 A recent Chicago transplant, his regional stage credits include Milwaukee Repertory, Court, Silk Road Rising, TimeLine and the Utah, Texas, Ohio and Virginia Shakespeare Festivals. TV: Chicago Fire. 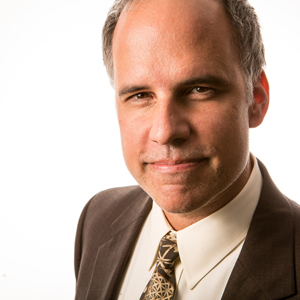 Andy is also the co-author of the musical comedy Murphy’s Law, which will receive its world premiere this spring at Pittsburgh’s Strand Theatre, and he has served on the theatre faculty at the University of Pittsburgh. Colm is a company member of Theater Oobleck, with whom he’s appeared in Song About Himself, There is a Happiness that Morning Is (NYC and Chicago), An Apology for the Course & Outcome of Certain Events Delivered by Doctor John Faustus on This His Final Evening, The Strangerer (NYC and Chicago), Letter Purloined, The Hunchback Variations and Spirits to Enforce. Other credits include Sweet Bird of Youth (Goodman); Trevor (A Red Orchid); Heart is a Lonely Hunter (Steppenwolf);Elevator Tours (Barrie Cole); Still in Play, The Caretaker, Waiting for Godot, Love Horse (Curious Theatre Branch); The Cabinet (Redmoon). 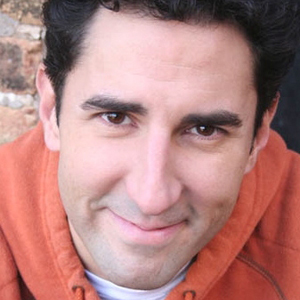 He also played Stanislavski #1 in Mickle Maher’s An Actor Prepares at the University of Chicago. He is the recipient of 3 Orgie Theater Awards. Credits include: Marie Antoinette (Steppenwolf); Black Diamond: The Year the Locusts Have Eaten, Around the World in 80 Days, Peter Pan A Play (Lookingglass); The Nutcracker,Rose and the Rime (House); Court Martial at Fort Devens (Victory Gardens); Sketchbook (Collaboraction); Ruined (Mixed Blood); Raisin in the Sun (Milwaukee Repertory); Seven Guitars (Pittsburgh Playwrights); Funk It Up About Nothin and Taming of the Shrew (Chicago Shakespeare); Stickfly, African Company Presents Richard III, Talented Tenth, The Colored Museum, 365 Plays/365 Days and Bulrusher with Congo Square, where she is also an ensemble member. She is a graduate of The Theatre Conservatory at Roosevelt University. Samuel is the Artistic Director of Congo Square and a Howard University alum. 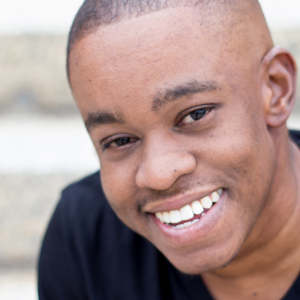 He is the recipient of a 3Arts Award and is a TCG Young Leader of Color. Roberson most recently directed Twisted Melodies at Congo Square. Other directing credits include The Last Cadillac and The Last Hand. He also assisted on Bulrusher and Twelve Angry Men. Chicago acting credits include: Samuel J and K (Steppenwolf), Civil War Christmas (Northlight), The Colored Museum and Sanctified (Congo Square),Living Green and The Lost Boys of Sudan (Victory Gardens) and The Ballad of Emmett Till (Goodman). Other acting credits: Penumbra, Children’s Theatre Company, Pillsbury House, Illusion, Imagination Stage, Source and Studio. He has taught with Victory Gardens, Congo Square, Steppenwolf, American Theatre Company, 16th Street and Children’s Theatre Company of Minneapolis. 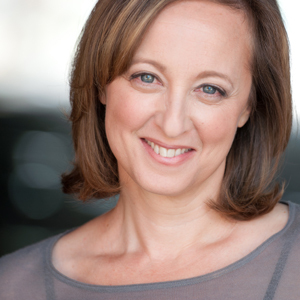 Joanne has worked onstage with Lookingglass, Jackalope, Silent Theatre Company and Chicago Dramatists, where she is also an artistic associate. 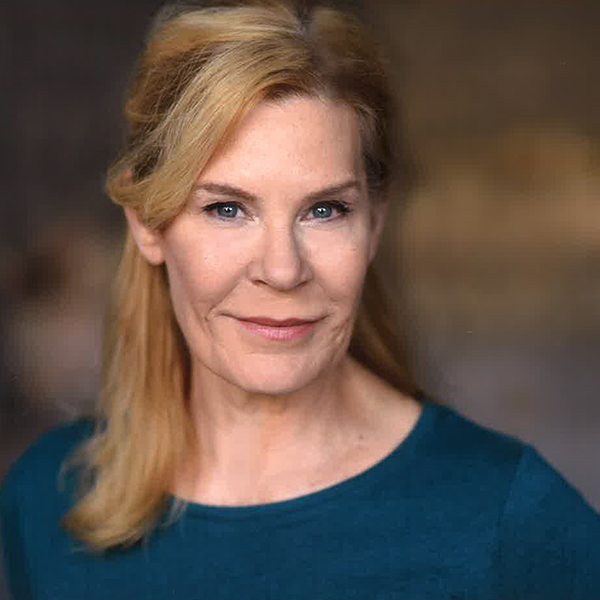 She has also worked regionally at Phoenix Theatre Inc. Joanne was Jeff-nominated for her performance in The Glass Menagerie with Mary-Arrchie and was awarded the Jack Springer Award for her performance in A Life at Northlight. She has her B.A. 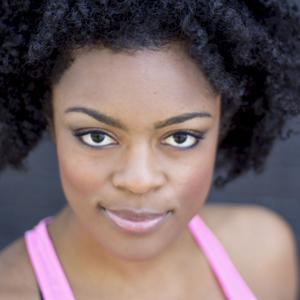 in Theatre and Drama from Indiana University and is a graduate of The School at Steppenwolf. Devon is thrilled to return to Northlight after directing Lost in Yonkers and formerly serving as the theatre’s Director of Education. 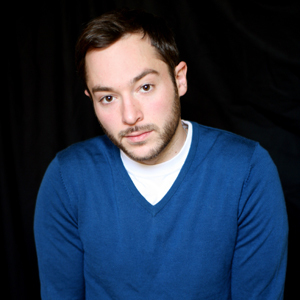 Most recently, Devon worked as the Resident Director under Stephen Daldry on the Tony-winning Broadway production of The Audience. Directing credits: Jet Black Chevrolet (side project); Compulsion and Everything is Illuminated (Next);An Actor Prepares (Logan Center); Roadkill Confidential, The Further Adventures of Hedda Gabler, Clouds (Dog & Pony); Infiltrating Bounce (Luminaria, San Antonio); and 52 (Canal Café, London). 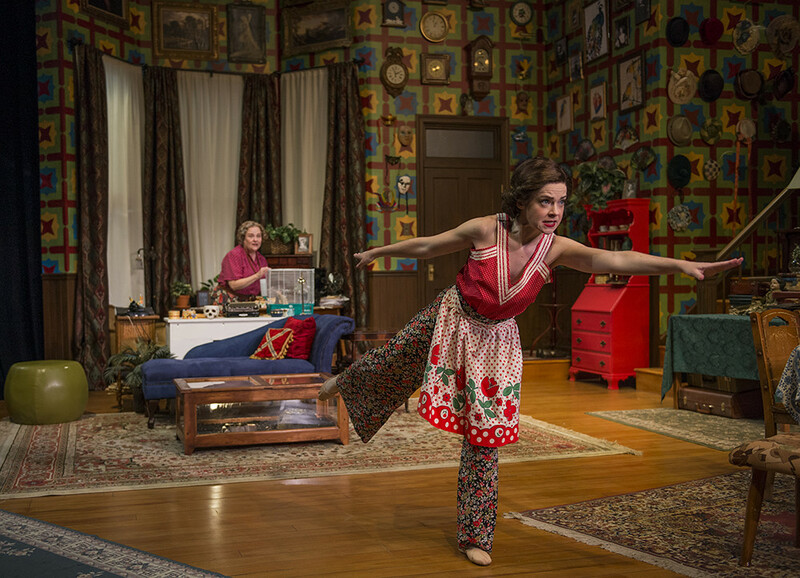 Directing & devising credits: Guerra: A Clown Play (performances in Chicago, New York, Albuquerque, Madrid, Bogota, and Mexico City); The Whole World is Watching, As Told by the Vivian Girls(Dog & Pony), and The Twins Would Like to Say (Dog & Pony, Steppenwolf Garage Rep). 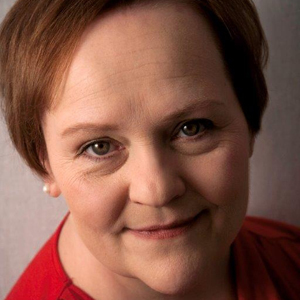 She is the co-artistic director of Dog & Pony Theatre and received her MFA from Middlesex University in London. Heather returns to Northlight where she previously designed You Can’t Take It With You, Mothers and Sons and Faceless. 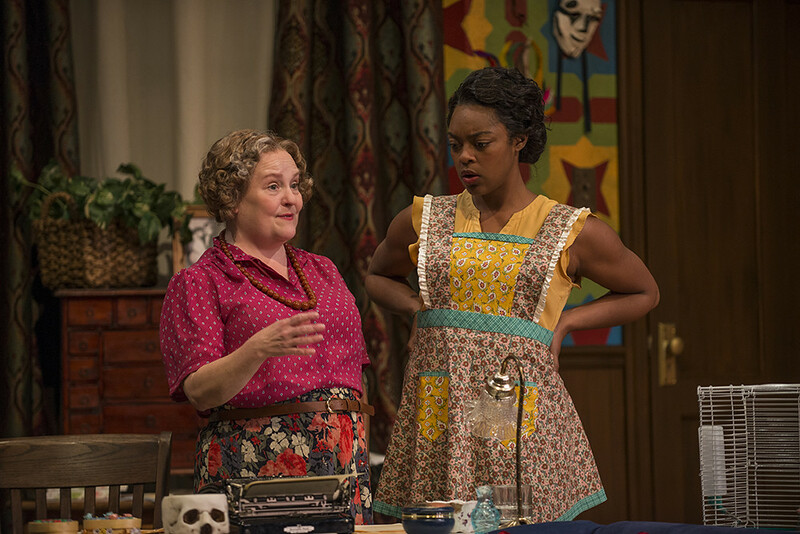 Ms. Gilbert’s lighting designs have been seen on many Chicago stages including Hypocrites, Goodman, Court, Steppenwolf, Steep, Victory Gardens, Remy Bumppo, Chicago Children’s Theatre, Writers, Timeline, About Face and countless storefronts. 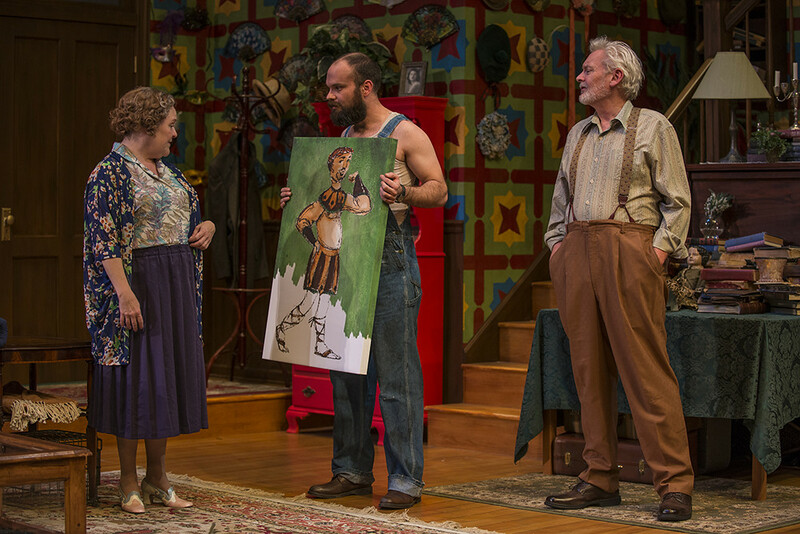 Regional credits include Oregon Shakespeare, American Repertory, Kansas City Repertory, Milwaukee Repertory, Huntington, Williamstown, Alley, Berkeley Repertory and Actors Theatre of Louisville. International credits include Almeida in London and Singapore Repertory. Heather was a recipient of the NEA/TCG Career Development Grant and the 3Arts Award. Heather serves as the Head of Lighting Design at Columbia College Chicago, and received her MFA at the Theatre School at DePaul. She is a member of The Hypocrites community. Kimberly is excited to be returning to Northlight Theatre. Her Northlight credits include Book of Will, Miss Bennet: Christmas at Pemberley, You Can’t Take it With You and Civil War Christmas. Chicago credits: Having Our Say, A View from the Bridge, Objects in the Mirror, Gloria, and Wonderful Town (Goodman) and Million Dollar Quartet. Broadway: Curtains. Off-Broadway credits: Bill W. and Dr. Bob, How to Save the World, John Ferguson. 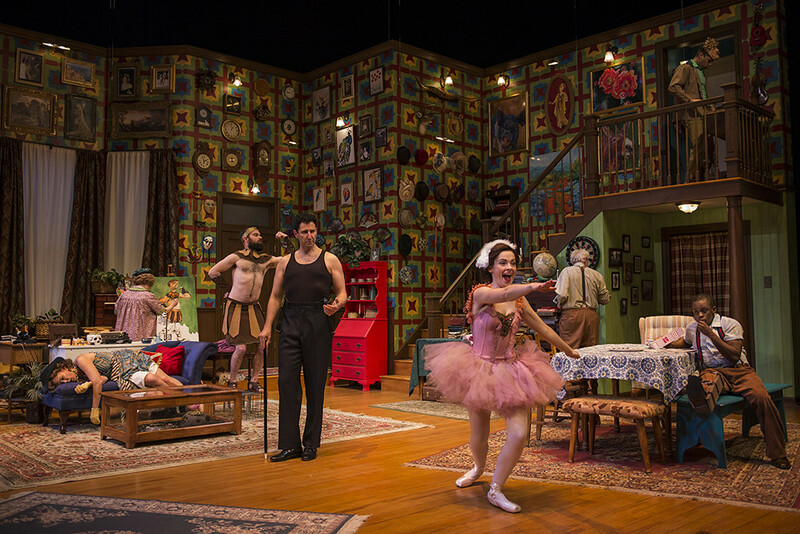 Regional: Tuacahn Center for the Arts, Skylight Music Theatre, and Milwaukee Rep. Other credits include Illinois Shakespeare Festival, Colorado Shakespeare Festival, and numerous productions at The Juilliard School. Kimberly is a proud member of Actors Equity.